OXO Tot Grape Cutter quickly and safely slices grapes into quarters. Eliminate the risk of choking on whole grapes by quartering them. This grape cutter features sharp, serrated, stainless steel blades that quickly and easily slice through grapes. 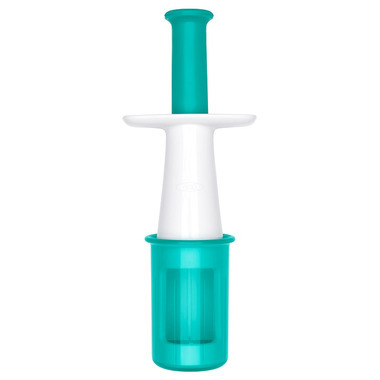 The curved finger rests provide comfort, even during repetitive use. 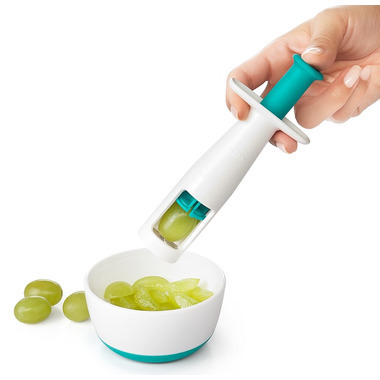 The Grape Cutter is great for making a healthy snack that is safe for tots to eat. The cover snaps on for safe storage and for taking on the go, and is top-rack dishwasher safe. The blades also cut through pitted olives and grape tomatoes with ease, making it perfect for making chicken salad, sangria, fruit salad, salsa and more. Cover snaps on for safe storage and on-the-go use.